Skoda has revealed eight – yes, eight – special Black Edition cars today. That’s one for every model in its range. Aside from the colour-coordinated design theme, the Citigo, Fabia, Roomster, Rapid, Rapid Spaceback, Octavia, Superb and Yeti Black Editions all get at least £1,200 worth of extra kit. The Octavia gets more than £3,200 worth of extra stuff, says Skoda, though the exact premium paid for that isn’t clear. Skoda hasn’t revealed the exact specification of every model, but has said that each Black Edition is based on SE specification with additional equipment including black alloy wheels, tinted windows, black exterior detailing, DAB digital radio, and full leather upholstery. All bar the Citigo, Roomster and Rapid can be specified with white paint. Available to order now, Black Edition prices begin at £10,090 for the Citigo, rising to £23,990 for the Yeti. To use those two as examples, a three-door Skoda Citigo SE 1.0 60 costs £9060, while a Skoda Yeti SE 2.0 TDI 110 lists at £19,565. 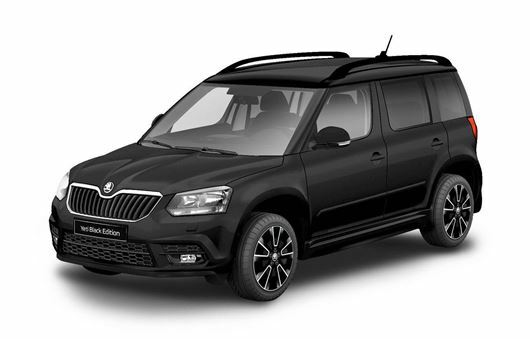 The priciest Yeti is currently the £21,475 Elegance 1.6 TDI Greenline – still some way below the Black Edition’s price. No specific engine details, but Skoda says that the Octavia Black Edition comes with a choice of either the 140 PS or 170PS versions of the 2.0-litre TDI diesel engine, either with a manual gearbox or DSG. Skoda Brand Director Alasdair Stewart said: “The Black Edition cars further enhance the cutting-edge contemporary style to the entire range of ŠKODA passenger cars, yet still have our core philosophy of value-for-money motoring at their centre."